For me the sequels are a major disappointment after the awesome Matrix 1-movie. So over the time the question arised in me: What if Matrix 1 had no sequels? 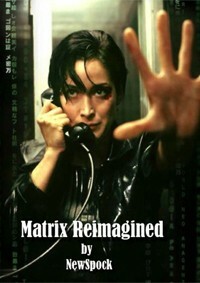 Using mere 15 minutes from the sequels, it was possible for me to reframe Matrix 1 and finish the story within Matrix 1. I simply love Matrix 1. It's a great cyberpunk-thriller that revolutionised the action/sciencefictiongenre. I went three times into the movie in the first weeks when it was still in cinemas and I couldn't await the sequel. Back then I couldn't imagine that the sequels would be anything but awesome... but they weren't. Matrix 1 was imho just perfect as it was, so I just kept rewatching that one, and only seldomly watching the sequels. Still, Matrix 1 is not complete, the fate of Zion was still open. So using 15 minutes from the sequels I synched the fate of Zion with the struggle of Neo becoming the one and to bring it to a conclusion within Matrix 1. I cut 255 minutes from the sequels, so I ended up with merely 15 minutes from the sequels, which I used to reframe Matrix 1, so that it would end as a stand-alone-movie with no need for sequels. I hate reviewing a fanedit that I really didn't like as I know the editor has put blood sweat and tears into the creation of his masterpiece. And I know that it hurts to receive harsh feedback. Having said that, NewSpock did ask for reviews, and just having positive reviews doesn't really serve the community especially with an edit like this - so here we go. There's a reason hardly anyone has touched the Matrix. It is a masterpiece. Pacing, shot selection, build-up, scene selection - genius. It told an extremely complex story with great dollops of philosophy in a relatively short space of time. It's genius was knowing what to leave out - particularly "Zion". Zion is left up to the viewers imagination, a warm place called home, something worth fighting for. Each of us imagined our own safe place, a haven. Then the sequels came and showed us one of the most boring places imaginable and everyone went meh! Unfortunately, this fanedit is the Matrix - with Zion. I watched this edit from two points of view: one as an existing Matrix fan looking for an alternative cut - the other as a first time viewer seeing this film in the cinema. Both of these personas hated this film. The Matrix fan was annoyed that his beloved Matrix was being sullied with, quite frankly, some of the WORST scenes from the sequels: Morpheus and Locke talking. Morpheus and Councillor Hamman talking. The boring prayer in the Temple. Morpheus yelling and shouting his prayer - which cuts to "the machines are digging". The end of the war battlements outside the Temple which look seriously low budget. And the Kid overacting with the end of the war. The newbie was left thrown right in to a boring talking heads conversation between Morpheus and Locke (who are they? Who's Neo? Why is Morpheus such a zealot? Who's the Oracle? Who's right and who's wrong? Why do we not see Locke again - he seemed to talk sense). The Temple scene followed by the abrupt cut to Locke in the War Room and "the machines are digging" *totally* nullifies Morpheus' optimism and makes him look like an idiot - some weirdo zealot with faith in Neo for, at this point, no reason whatsoever (makes more sense in the sequel). Then we cut abruptly to Cypher and Neo on the Neb - why? What was their reaction to the prayer. What does Neo think about Morpheus's misplaced faith? THe additional scenes raise far more questions than they answer. The ending is the Kid yelling "the war is over" which would have been an suitable place to end this fanedit (seeing as adding all the bits of Zion - seeing what Neo was fighting to save - seemed to be the Raison d'être for this edit) - but then we cut to Neo talking to the Machines on the phone (the end of the Matrix). Why? Haven't they just been defeated. Didn't the Kid just yell "THE WAR IS OVER". WHy is NEo being all threatening about world without rules blah blah? in the context of this edit it makes no sense! At every step the Matrix was weakened by the additions. The characters were made weaker, the pacing was off, Zion was reduced to a boring mosh pit of faceless made-for-TV characters... in short, a lot of the problems of the sequels were brought in to the Matrix! Yuck. Also the sound mix was reduced to stereo - so even the bits I enjoyed (the MATRIX) was duller than usual because the sound mix was off. Yuck. Now that I've slaughtered the film (sorry NewSpock), let me draw out some positives: the editing was seamless, particularly the sound editing. Visual fidelity was top-notch (HD 1080p quality). Great care was taken with scene selection and the way they were edited. There's a great deal of passion in this project, and that comes through in the care and attention to detail. NewSpock has good potential as an editor, that much is certain. Watch this man! It's not my Preferred edit, of The Matrix, I also feel like it didn't really work that well, but I downloaded it and I watched it all the way through because it's mentioned that it concludes the whole story with Neo flying up past the camera, as in the ending of The Matrix 1. That was enough to get me to watch as I feel that Revolutions originally is depressing as hell. The main people I care about is Neo and Trinity, and I didn't watch a whole trilogy just to see them die, and see an underground civilization which didn't seem all that interesting except that they knew how to dance and fly machines (and that's about it), live. Still, I don't feel this edit worked all that well with the integration of the few scenes that are added from the sequels but it's worth watching because it ends the story on a positive note, similar to The Matrix Hacked editions. Thanks for watching and reviewing my edit. Different people always experience things than others. Narrative choices are personal things and therefore reception is also personal as well, for some my narration will work, for others it won't. That's life and I accept it. But what I can't understand: What caused you to downgrade my edit in the visual editing- and audio editing-departments? A huge injustice, if you ask me. i reviewed this edit when it first come out. i reviewed it with a whole different idea in mind for what i was going to watch. after talking to newspock i watched it again and after what he said and i have to say it really does work and its a really good edit (its still a bit to big at 17 gig) but it is worth a look if you want to see the matrix that tells the whole story in one movie. It has been over 5 years since I last watched a Matrix movie. I have seen the first one maybe 3 times and the sequels only once. So I was quite fresh when watching this edit. I too was disappointed by the sequels, but liked the first one a lot, so the premise of this edit seemed very intriguing. Audio and video editing and quality were overall very good. I knocked a point off from the editing as there were a few "too fast" scene changes - The most noticeable being the first cut to Zion command centre. Story wise - I did like how NewSpock tried to fit the events that happened insinde the matrix in Matrix 1 to the events that happened outside it during the whole trilogy. Unfortunately it fell a little short. There was something missing... I felt that the added content was too limited, in most places creating more gaps then removing them. Some added things and scenes would have needed more explaining and screen time. Some of the scenes felt a little out of place too - you could notice it's added there. Also the ending did not fit with the added content. I would hope NewSpock will make an "extended" version of this with more content from the sequels and fleshing out more the attack to Zion and Neo's final victory and its effects. Still, as this edit is mostly Matrix 1, it managed to deliver the same kind of enjoyment I remeber Matrix 1 did for me (and made me watch a fanedit of the sequels to completely see what happened). Before you read any further, please note that THIS REVIEW CONTAINS SOME SPOILERS. You have been warned. I've been a big fan of The Matrix since seeing it at the cinema; I also greatly enjoyed The Animatrix. I have no such affection for Reloaded or Revolutions, for the same sort of reasons that many people don't much like them. This edit is in my mind a resounding success - not as a reimagining, but as a reframing. 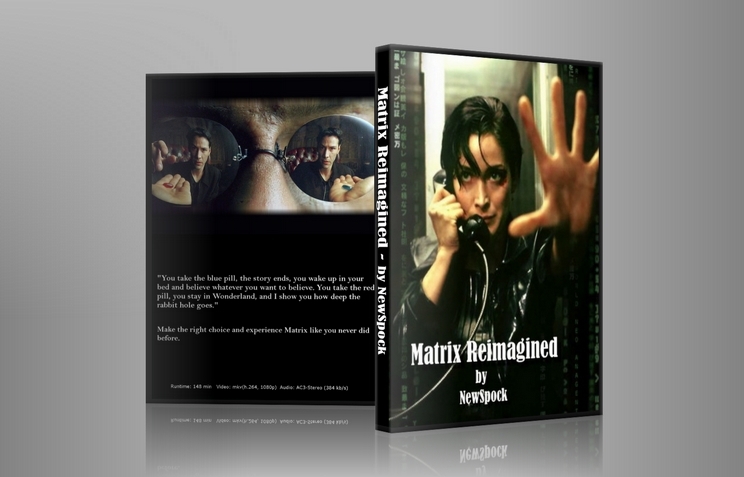 (I suspect a better title for it would be "The Matrix Reconfigured" than "Reimagined"). There are very few things I'd seek to change about The Matrix, but in this edit NewSpock has added just enough material from the sequels to cast the film's events in a new light that lends them more importance. The scenes with Morpheus and Locke in Zion help to flesh out the throughline of Morpheus' character arc (his faith in Neo as The One), and the buildup to the machines attacking Zion helps add an urgency to already-tense action scenes. Video and audio quality is great, with a 17GB HD MKV - the editing is seamlessly done, with no issues whatsoever that I could see. If I wanted to nitpick, the only thing I'd say I was slightly disappointed about was the epilogue. It always felt a bit weak to me, and I'd almost prefer to have it cut completely. Given the limited material available to work with (and the problematic nature of trying to use any more material from the end of Revolutions) I can understand why NewSpock went this way, though. For those of us who dislike the sequels in their original form, I think this edit is the best possible presentation of the original film.